The first race for the new Figaro Bénéteau 3, the Sardinha Cup was certainly exciting at sea with victory going to Yann Eliès and Sam Davies (StMichel), but a lot happened ashore too with a number of technical problems which led to a series of meetings. 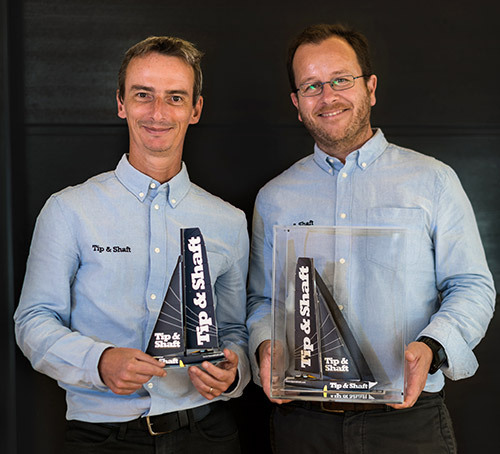 Tip & Shaft identifies the lessons learnt from this race with several of the participants (Yann Eliès, Jérémie Beyou, Anthony Marchand, Fred Duthil, Gildas Mahé and Pierre Quiroga) and the Race Director, Francis Le Goff. It does not happen so often in racing sponsorship: an equipment manufacturer gives its name to a sailing event. After a successful first experience last year, Plastimo is teaming up again with Lorient Grand Large, the organiser of the first Atlantic-side Mini 6.50 race in the season in France, and names the event the Plastimo Lorient Mini 6.50. For the french company based in Lorient, it means much more than simply lending a hand. In the wake of victory in the Volvo Ocean Race with Dongfeng Race Team, Pascal Bidégorry spent the latter part of last year helping young French skipper Arthur Le Vaillant prepare his Class40 for the Route du Rhum-Destination Guadeloupe. He is continuing that collaboration with Le Vaillant right now as they train on the Figaro 3 Leyton. And the duo will sail the Sardinha Cup at the end of March But at the same time the Basque bred sailor Bidégorry is looking for sponsoring partners to back him on an Ultim. But he is also cited as one of the potential successors for Sébastien Josse in the Gitana Team hot seat. He covers all these topics for Tip & Shaft. Launched in 2015 by Axel Capron, a former editor-in-chief of Sports.fr, and Pierre-Yves Lautrou, a past journalist at L’Express, Tip & Shaft represents the informed, unbiased voice commentating and reporting on the world of competitive sailing. Tip & Shaft develops high value-added, original content delivered to an active, passionate audience via an innovative editorial newsletter. It is distributed each Friday only by email to more than 5,300 subscribers: racers, sponsors, journalists, communicators, manufacturers, agents suppliers and fans of sail racing. It grows consistently and is 50% bigger than on Day 1. November 2015: launch of the Tip & Shaft newsletter. sail racing professionals and those interested in high level learning. October 2018: launch of the international edition in English, in partnership with Andi Robertson. November 2018: Launch of Into The Wind, Tip & Shaft’s monthly podcast. Staring out as a sports journalist at Teléstar, Axel joined the editorial staff of Sports.fr to cover sailing, before rising to the role of chief editor. He was then appointed Newsworld’s sports news editor (Lagardère Active Media Group) until March 2015. He co-founded Tip & Shaft with Pierre-Yves Lautrou in November 2015. PYL was a journalist at L’Express for 15 years, where he covered not only sailing but also wrote on politics and economics until July 2015. He has been the author of the blog Au Large for a decade. He is an experienced racer, sailing for many years in the Mini (Mini-Transat 2001) and Class40 (Route du Rhum 2014). He co-founded Tip & Shaft with Axel Capron in November 2015. On Into The Wind sailors take the time to reflect in depth on their career, recent and past and look to their future. They talk frankly and openly about what makes them tick, about their life and their highs and lows. Tip & Shaft sets out to explore their courses, to understand what defines the sailors who take to the water to compete whether it is for a few hours or months at a time, solo or fully crewed, in a bay or around the world. Sailors are often people of few words. Tip & Shaft seeks to give them the time and the opportunity to talk, so that we can share their adventures and experiences. Business meetings for the different sectors of sail racing. Feedback and shared experiences from leading exponents. Training (business, communication, project management and optimisation) for professionals and committed enthusiasts.